After Kusan ceased production in the United States, they sold the original K-Series molds to Plasticos Leon in 1960. The trains were produced in Mexico four years, and the remaining stock was sold there until 1968. Production estimates for the Mexican market vary from as many as 10,000 train sets per year, to as few as 5,000 total items in four years. The factory address was Plasticos Leon, S. A. Apartado 1411, Monterrey, N.L., Mexico. Kusan Mexican production Nacionales de Mexico (N de M) El Azteca Alco AA units No. 2716. The original two-piece factory boxes they came in were plain white. Kusan Mexican production Nacionales de Mexico (N de M) El Internacional Alco A unit No. 2716. The lettering was applied using decals on the yellow and dark gray painted body. Kusan Mexican production Nacionales de Mexico (N de M) general-purpose four-wheel switcher No. 3206. The black lettering was stamped on a gray painted body. There is an oval "Juguetes Kusan Mexicanos" sticker on the bottom. Kusan Mexican production unmarked and unnumbered general-purpose four-wheel switcher. Kusan Mexican production Sears Roebuck de Mexico, S.A. DE C.V. boxcar. All graphics and lettering on this molded red plastic car were applied using decals. There is an oval "Juguetes Kusan Mexicanos" sticker on the bottom. Kusan Mexican production Nacionales de Mexico (N de M) 9657 Carta Blanca beer boxcar. The car is molded white plastic with a light yellow painted roof and ends. The Carta Blanca and gold seal graphics were applied using decals. The black lettering and other graphics were stamped. Kusan Mexican production Cervecería Cuauhtémoc Carta Blanca beer boxcar. The car is plastic painted yellow. The Carta Blanca graphic and other car lettering were applied using decals. Cervecería Cuauhtémoc is a Monterrey, Mexico brewery. Kusan Mexican production Chihuahua Pacifico (CH.P) 21137 Garci-Crespo mineral water boxcar. The car is molded gray plastic. The Garci-Crespo graphics and lettering to the right of the car door were applied as a single decal. The black lettering to the left of the door was stamped. There is a rectangular "Mexico" import sticker on the bottom. Kusan Mexican production Ejercito Mexicano 87153 Explosivos Peligro boxcar. The car is molded black plastic painted army green. The lettering and other graphics were stamped. There is an oval "Juguetes Kusan Mexicanos" sticker on the bottom. Kusan Mexican production Nacionales de Mexico (N de M) 9875 Hojalata Y Lamina, S.A., Monterrey, N.L. Hylsa hopper. There is a small white rectangular "Mexico" import sticker on the bottom of the car. Kusan Mexican production Tubacero gondola. "Hecho en Mexico" and a bird head are printed inside the oval on the car side. There is a small white rectangular "Mexico" import sticker on the bottom of the car. Kusan Mexican production U.S. Space Research 4190 gondola. The car is plastic painted gray and the lettering was applied using decals. This gondola is similar to the one included with the American-made Kusan Satellite Train. Kusan Mexican production crane car. The orange crane can swivel 360 degrees and the hook may be lowered or raised by manually turning the black hand crank on the side. A white figure is glued to the green flatcar deck. 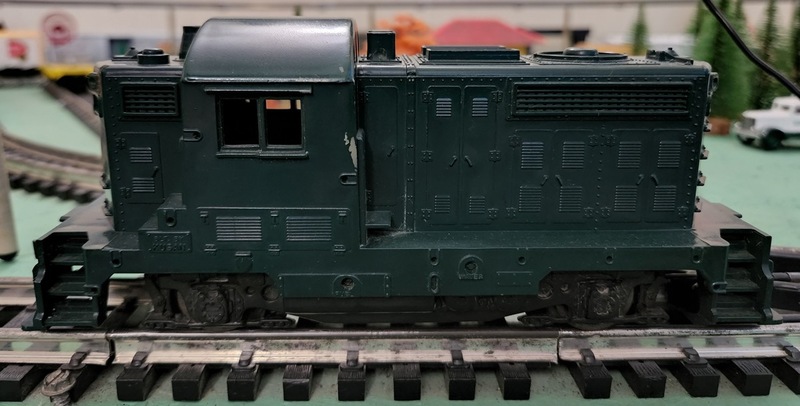 There is also a small white rectangular "Mexico" import sticker on the deck of the flatcar. Kusan Mexican production auto loader. The design of this car was based on the postwar Lionel auto loader. There is a small white rectangular "Mexico" import sticker on the bottom of the car. Kusan Mexican production toy train box - front view with cellophane window. Kusan Mexican production toy train box - rear view showing company address.